"Sparring against a twice ISKA Kickboxing World Champion"! "Sparring against European and Irish Kickboxing Champions"! "Five hundred press-ups and sit-ups a day"! "Fitting in five hours training a day when working full time"! I never thought for one second the above would become achievable..especially at 50 years old! My below story became my obsession. I set myself a goal. A Black Belt in a Martial Art or nothing! I envisioned the day I earned the highest belt achievable in Martial Arts and made this my goal. I took my eye off the ball towards the end..but I got back on track. We all have goals and dreams and we can all take our eye off the ball (hey, we're human) but only you, can get back on track! So why am I publishing it. I was contacted through a friend to submit my journey to a local online media outlet. 'It may help others' I was told. Decide for yourself. A number of years ago, after passing my 40th birthday I decided I wanted to do something completely off the wall, maybe plan to climb a mountain or train to run a marathon, something to prove age is only a number. Nine years ago I was flicking through a local newspaper and noticed a new Kickboxing for Beginners class starting up near where I work. That was it. I was going to join a Martial Arts school and go all the way up to black belt. I remember phoning the number, speaking to Tommy McCafferty (head-coach and owner of KickboxingLK) and Tommy telling me to come along. That Tuesday night walking in was daunting. This is why I also understand how difficult it is for anyone taking that first step and why I always help anyone coming along to the club to take that first step. That in itself is a huge psychological step with many backing out just before entering through the door. THAT FIRST STEP...AND TAKING MY EYE OFF THE BALL! I joined up and was completely bitten by the Martial Arts bug and throughout the early years loved it with a passion. It's been an amazing journey, going through the different belt gradings, the discipline and hard work, the pride of being presented with the belts. Achieving Brown belt was tough. How would I ever push myself to get that black belt. I then took my eye off the ball. I would finish work and go home, making excuses that training was cancelled or I'll get back to it next week or I just couldn't be bothered anymore. I'd show up for training one night and then miss the next few sessions. I knew through the excuses I was letting my wife and daughters down as they were the ones that questioned why I wasn't training and never once complained throughout the years of Kickboxing (the missing school plays, getting home late from training etc.). My fitness levels dropped and I even noticed I was taking this lethargic feeling into work. Deep down I was so annoyed with myself. It was during this phase that I also underwent a health-check through work. I was told my cholestoral level had increased significantly and I should make an appointment with my doctor at the very earliest, who would put me on a tablet a day for life. About a month into self pity I received a message from Tommy asking was I coming back to training- "you have come so far Jimmy". After exchanging a few messages I told him I'd be back for the next training session and would get my Black Belt. I got back into the gym prior to training and pushed myself. Training was excellent and after a few weeks I was, not only back into the swing of things but physically felt better than ever. I visited my doctor who told me my cholestoral level was excellent. No tablet for life! Two years of training the word came that grading for Brown and Black belts were on the horizon and Tommy would be putting forward a few club members to grade up in Lurgan, Northern Ireland and that other clubs from the north would also be sending members. Three months to grading we were told we need to put in extra work as the grading would last six hours. We learnt also that some of these members from other clubs also grading were Irish & UK and European Kickboxing title holders but this gave us the extra incentive to train harder. This was now three months of extra sparring sessions, training before work and up to four hours training after work. Grading date was 13th January 2018 so this meant a slightly different Christmas this year. I had a couple of days off and enjoyed them but it was then back to training. An intense training and sparring session was held at WestBank Kickboxing club, Derry on New Years Eve morning and I looked forward to a few drinks that night, knowing this would be the last night out until after grading. The week leading up to grading was a week of not sleeping well. 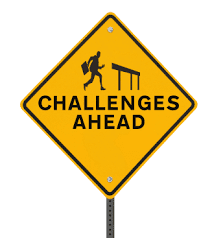 Everything was going through my head, "was I fit enough", "have I done enough training", "where's my gum shield", "stay away from anyone with this dreaded flu so I don't catch it", "testing myself on different combinations etc". I fell twice when checking my oil tank, both times banging my knee on a rock. I tripped when placing a plate in my dishwasher and a fork went under my finger nail causing it to bleed. This can't be happening three days before grading!! My wife and daughters were amazing. Carmel made sure my diet was correct, the conservatory was turned into a gym, my twelve year old daughter Katie bringing me into the world of Spotify when running and the words of encouragement printed off and placed on the walls, the constant "you can do this" from my wife, Carmel and daughters Chloe, Serena and Katie and the lovely steak dinner the night before grading. Six of us from the club were grading (four going for Brown Belts and two going for Black Belt). The last training session, Thursday before grading, our coach, Tommy called us together and told us "That's it. No more training. Take Friday to rest and relax before Saturday". Saturday morning I was buzzing. Had I packed everything. If I forget something I won't be allowed to grade. We travelled up to Lurgan in two cars. Tommy kept telling us "no matter how tough it gets, do not give up. We are representing KickboxingLK and go in with up most confidence". I couldn't have asked to be heading to Lurgan with a better group of people all willing each other on. Grading was tough and lasted just under six hours. I won't elaborate too much as it wouldn't be fair on others going on to grade but after only fifteen minutes in we were all exhausted wondering how we would last another five hours and forty five minutes. We were soon put at ease when the judge's told us this is nervous exhaustion and this would pass. Grading is designed to test your body and mind as well as techniques, fitness and sparring. Tommy knew I was getting it tough about 4 hours in. The cramps in my legs, my ribs were on fire (even though I had worked on blotting out pain) and now I had 20 rounds of sparring with different oponents ahead of me. I was completely shot. I had given it my all and was exhausted both mentally and physically. At the 17th round of sparring I was digging deep and feeling physically sick. This was the part that tested you how much you wanted that Black Belt. The thoughts of that Black Belt and going back to my family spurred me on. Not only that but I was representing the club and I wasn't going back having failed. Between rounds was spent trying to relieve the cramps. Twentieth round and grading was over. I was so exhausted I didn't know if I had done enough. I was annoyed with myself because I felt I had taken kicks and punches I should have defended. I felt my combinations should have been better. We were called together and congratulated. I had done it. I was told I had passed the grading. Tommy presented me with my Black Belt and gave me that look of "you done it". He knew (as did my closest family and friends) what this belt meant to me. Only these people understood the training, the not going out socialising, the salads/pasta nearly every day at work and they were the ones who encouraged me every step of the way! The drive back home, walking in the door and sharing my moment with Carmel and my daughters had run through my head for years and now it was coming true. I was physically and mentally exhausted but I was on cloud nine. The amount of congratulations and messages I received has been humbling and amazing. IF I CAN DO IT...SO CAN YOU! Thank you to to each and every member of KickboxingLK (an amazing club and bunch of people), China Coyle at WestBank for the priceless nuggets of advice, the grading panel of judges at Fight Club NI. Most of all thank you to my wife Carmel and daughters, Chloe, Serena, Katie (I could not have done this without them!) and my family for all you have done for me to help me achieve my goal and head-Coach, and good friend, Tommy "The Ghost" McCafferty for all the training, tips and advice throughout the years (and the messages to get me back). 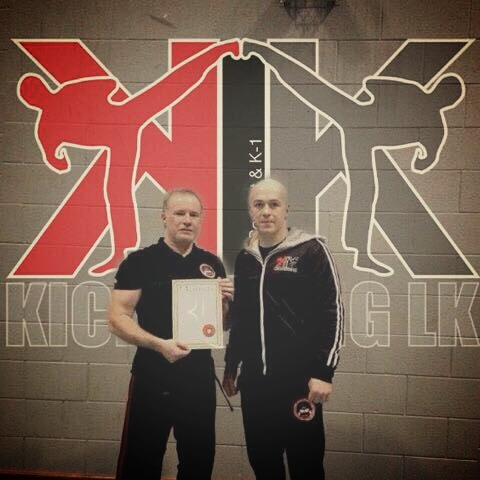 I'm proud that KickboxingLK is now in it's tenth year and I have been with it every step of the way to the huge success it is today. I am so extremely passionate about exercising and the positive effects it has on your body and mind no matter what age you are. I am employed by Optum / UnitedHealth Group. I use the positiveness of Martial Art every day at work to do my very best. I encourage any person that wants to get fitter to take that first step. I push and promote KickboxingLK to others as I know first hand how it improves both your physical and mental health (as well as improving your fitness) whilst learning a Martial Art. I help and mentor youngsters training every Saturday morning. I run Monday - Friday 30 minute boot-style early morning fitness classes open to Optum employees using our onsite fitness suite. I continue to train and spar at KickboxingLK Tuesdays, Thursdays and Saturday mornings as well as using a local gym. I'm 50 years old and am in the best shape of my life. If I can do this...so can you!! 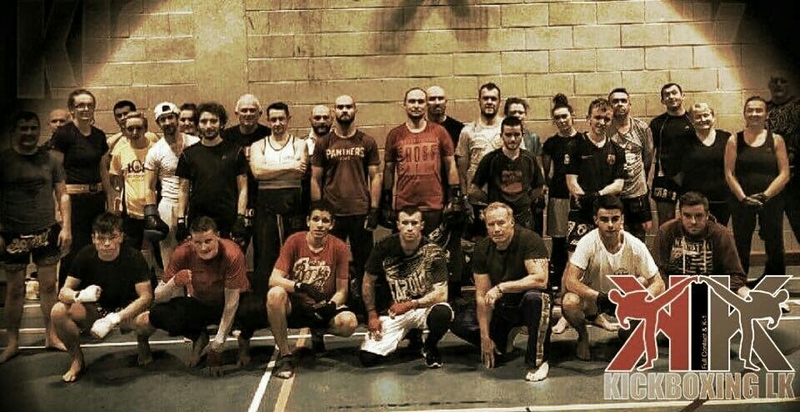 KickboxingLK train under owner and head-coach Tommy 'The Ghost' McCafferty. If you are interested in coming along check them out at Facebook.com/KickboxingLK. Beginners are always welcome. Belts are not given lightly...They are earned!! Setting the bar....and why we fail ! SETTING THE BAR...AND WHY WE FAIL! We all do it. We all set personal targets...and we fail. Why? Because we are human beings and it's built into us to achieve. What we do though is set targets or goals and expect immediate results. If we don't see change in one week what do we do? We 'throw our dummy out of the pram'! and give in...wrong approach guys. If you are twenty stone (only using this as an example), and decide, "That's it. I'm going to hit my target weight of twelve stone" work hard, hitting the road, gym, diet etc. and a week later you jump on the scales, no change...You look in the mirror, no change.you're not hearing the "OMG, you look amazing. What are you doing" compliments, what do most people do? They give up. They withdraw into themselves. They make the excuses "Well I did try"...Bullsh*t!! Excuses Excuses!! Welcome to my new workout channel. Perfect way to improve posture, strengthen your core, burn calories, build muscle, tone up & feel good. Before starting ensure you have a bottle of water close to you. The 30 minute workout is tried & tested through years of training and learning. Do subscribe to my PecsFactor Youtube channel. Remember - Seek medical advice before embarking on any high intensity fitness programme. HAVE YOU GOT THE PECSFACTOR? All material on this site is owned by Jimmy McCarthy and JimmyMcCarthy.com.